This page contains easter eggs for the disc Zombie (Anchor Bay) (DVD, Region 1). From the main menu go to the "Extras" menu.Highlight the 'Posters & Stills' entry then press your Right button to highlight a zombie skull. 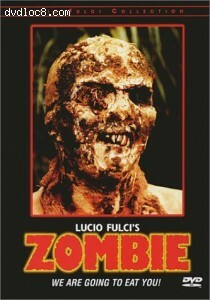 Press your Enter button for almost 30 minutes worth of trailers of movies by director Lucio Fulci.